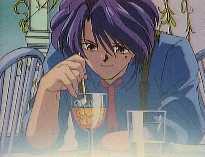 .Miaka Yuki is an ordinary junior high school student who is suddenly whisked away into the world of a book. The Universe of the Four Gods. There she becomes the priestess of the god Suzaku, and is charged with finding all seven of her Celestial Warrior protectors. Yet she still manages to worry about her grades and where her next meal is coming from!